In the hustle of building your coaching business, have you ever overlooked the “Chemistry or Fit” between you and the client? Maybe signed up a client knowing the match wasn’t quite right? Learn why it’s important to determine beforehand, if we will have the right chemistry with our clients. Plus, how to know if it’s a good match for building a strong coaching relationship. Conversely, what if at the outset all was great, then over time the chemistry fades and the fit is no longer working. What can we do to reignite it when it gets lost along the way? Or if it can’t be revived, we will discuss the steps needed to graciously bow out of the coaching engagement. Debbie Laxer, ACC founder of Laxer and Associates, has over 20 years of experience as a senior level HR professional with firms such as The Body Shop, RDU Airport Authority, Dress for Success, Triangle Leadership, the City of Raleigh, and Genworth Financial. She has partnered with many small businesses in the Triangle area in all matters of HR, strategic consulting and coaching. A graduate of Concordia University in Montreal, Canada, Debbie has an MBA and an SPHR designation. Debbie is also a certified business coach and an International Coaching Federation Associate Certified Coach (ACC). Her coaching clients include leaders at all levels who are smart enough to know they want to be better. Debbie’s supportive and straight forward style of coaching enables individuals to identify their inhibiting behaviors and help them move past them to become their very best. Her consulting skills allow her to brainstorm with clients so that ideas and solutions can be quickly generated. Please contact us , if you want to facilitate a Cutting Edge Conversation event. understanding of its parts, and a plan for how to cultivate it. Genuine curiosity is a guiding principle in our work as coaches, leading us and our clients to a better self. One of a coach's greatest senses of accomplishment comes from knowing they helped their clients move forward in achieving their personal and professional goals. Being deeply curious is an essential part of effective coaching. The impact of curiosity is often overlooked even though it precedes nearly every personal experience. At some level, it influences our decisions and drives us to what is next. Yet, research indicates many don’t consider themselves curious. We will explore curiosity as a human behavior and a state-of-mind by reviewing current research, learning from today's thought leaders, and engaging in a dynamic discussion about the power of curiosity. We will also explore ways to recognize curiosity and how it impacts growth and development. The session details the four components of curiosity through an interactive dialog for participants to gain a fresh perspective on openness, inquisitiveness, problem solving and distress tolerance. The full benefit of curiosity is achieved when we break it down into actionable parts and design a path to cultivate it within ourselves and ultimately with our clients. Sadly, current trends are eroding our ability to stay curious. When harnessed, curiosity moves us forward in nearly every aspect of professional and personal life. Together, lets learn how to fully leverage curiosity to impact an individual's ability to make better decisions, navigate challenging conversations, remain optimistic, drive personal growth, and improve learning and memory. Paul Winston is a Learning & Development leader, Executive Coach and Youth Group Director. He is passionate about all things related to moving individuals to a higher level of competence and confidence. 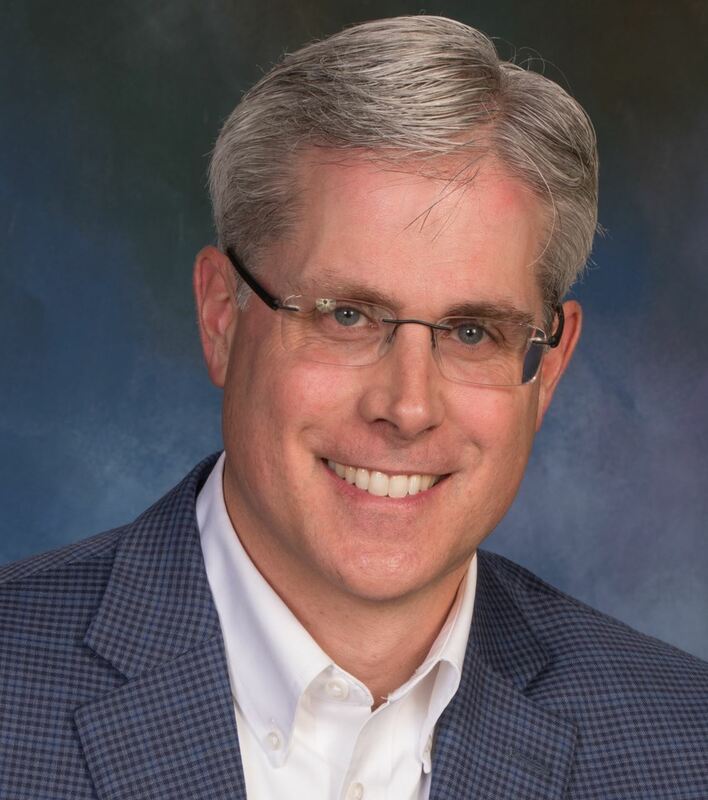 His career in Human Resources has spanned small family businesses, city government, and a F100 company, both domestic and international roles. Paul has experienced the life changing impact of being coached and has spent his career coaching leaders at all level of the organization. Paul recently traversed a curiosity journey of his own by recognizing that 20 years in corporate America resulted in his curiosity going nearly dormant. Paul has spent the last two year rediscovering his own curiosity and has learned a few things about this uniquely human train along the way. Paul believes most answers needed for success reside just beyond the noise. Becoming curious places us in the right state-of-mind to identify those answers. Join Paul as he shares personal stories, recent research and leads a dynamic discussion about the power of curiosity. Lunch options from Panera are available for selection during the registration process. Please contact us if you are interested in facilitating a program or have questions about events. WHO: YOU! All Coaches, Coaches-To-Be, Friends of Coaches, and anyone interested in learning about coaching are encouraged to participate in the Coach Connect meeting. If you are someone who is passionate about helping coaches advance their career or business, this event is for you too. WHAT: This is an informal, ongoing series of networking events to learn all about coaching, the business of coaching, coach training, and many more coaching related topics. It is a chance to meet other professionals in our field and exchange knowledge and our coaching experiences. Whether you are a new coach, a seasoned coach, or you want to learn more about coaching and/or how to become a coach, this event is for you! Come for the Coach Connect meeting and learn how to embrace a coaching culture. Bring your lunch, drinks, or snacks. Food and drinks also available for purchase at Frontier Canteen. Free Parking Available at The Frontier. Contact us if you have any Coach Connect questions. 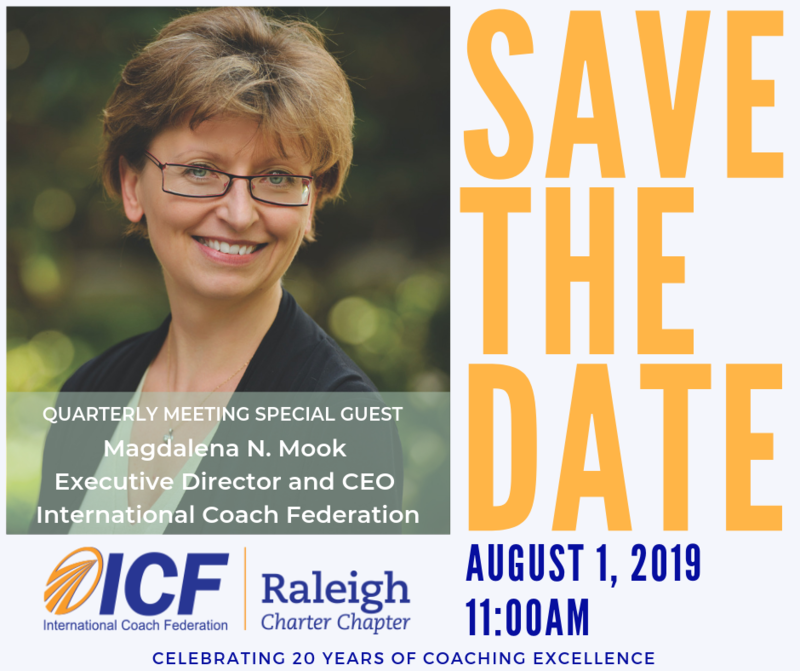 SAVE THE DATE - Magda Mook, ICF CEO is Coming to Town! Thursday, September 27, 2018 RESCHEDULED - Raleigh Cutting Edge Conversation: Coach as Colleague, Friend, Partner, Spouse, Parent! Thursday, September 13, 2018 CANCELED - Raleigh Cutting Edge Conversation: Coach as Colleague, Friend, Partner, Spouse, Parent! Tuesday, November 21, 2017 DURHAM Cutting Edge Conversation: How to gracefully end the Coaching Relationship? Thursday, March 23, 2017 Cutting Edge Conversation: Can You Hear, See or Feel What I'm Saying? Thursday, February 09, 2017 Cutting Edge Conversation: Spirit - An Accessible Coaching Tool? Thursday, October 27, 2016 Cutting Edge Conversation: Ending the Coaching Contract: Is it Good-bye or Just Au Revoir? Thursday, October 29, 2015 Cutting Edge Conversations: Remote or Face-to-Face? Tuesday, September 29, 2015 Triad Cutting Edge Conversations: How do you as a coach promote direct communication with your clients? Tuesday, August 25, 2015 Triad Cutting Edge Conversations: What Do We Mean by “Accountability” in Coaching? Thursday, July 30, 2015 Triad Cutting Edge Conversations: What Do We Mean by "Accountability" in Coaching? Wednesday, June 17, 2015 Triad Cutting Edge Conversations: What Do We Mean by "Accountability" in Coaching? Thursday, June 11, 2015 Durham Cutting Edge Conversation: Your Year - Your Word - Revisited! Wednesday, April 29, 2015 ICF Raleigh - Triad Cutting Edge Conversations: How Do We Promote Creating Awareness in Our Clients on a Consistent Basis? Thursday, April 23, 2015 Cutting Edge Conversation:Listening Skills for Coaching and Beyond! Thursday, July 24, 2014 Cutting Edge Conversations: Start With "Why?" Thursday, June 26, 2014 Cutting Edge Conversations: A DEEP BREATH! Thursday, April 24, 2014 Cutting Edge Conversations: Coaching with the presupposition, “Behind every behavior is a positive intention". Thursday, March 27, 2014 Cutting Edge Conversations: Are you sweating while coaching your client? Thursday, February 27, 2014 Cutting Edge Conversations: What is uncomfortable for you? Thursday, October 24, 2013 Cutting Edge Conversations: Boo! Who's Hiding Behind That Mask? Thursday, September 26, 2013 Cutting Edge Conversations: Bee the Queen Bee! Wednesday, May 22, 2013 Coaching: The Secret Strategy to Your Ultimate Success! Wednesday, February 13, 2013 Annual Meeting - All Welcome! Wednesday, December 12, 2012 Open Mic Luncheon! Wednesday, August 22, 2012 Cutting Edge Hot Topic: Are You Willing to Get Paid? Wednesday, June 27, 2012 Cutting Edge Hot Topic: I Am a Member, Now What?